About the series: This lecture series presents social innovators/entrepreneurs, their journey, their models for delivering social impact, the lessons learnt and their tips/pointers for the next generation of social innovators/ entrepreneurs. 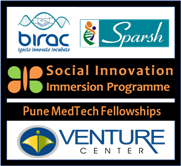 Organized by: Social Innovation Immersion Program at venture Center; INCLUDE program at Venture Center. (13 Feb 2015) UK-India Joint Workshop on "Affordable medical diagnostics and devices: From ideation to commercialization"
(29 Nov 2016) 3rd Social Innovation Lecture Series - "Innovating affordable and sustainable products"
(3 Mar 2015) 2nd Social Innovation Lecture Series - "Knowing Why's and What's of Social Entrepreneurship"